Do you preserves fruits and vegetables, jams and jellies? We can preserve all sorts of foods, but why not preserve the blessings too? Use this “Blessing Jar” to count your blessings in the new year. It’s so easy. Starting January 1st, write down any good thing that happens to you or your family on small Post-its or scraps of paper. Write whenever they happen, it doesn’t have to be every day, or sometimes it might be several times a day! Write just enough to jog your memory: you only need a few words and a few seconds of time. Fold them up and “preserve” them in your Blessing Jar. Then choose a holiday at the end of 2015 —like Thanksgiving, Christmas or New Year’s Eve. Open your jar and see what the Lord did for you throughout the year! 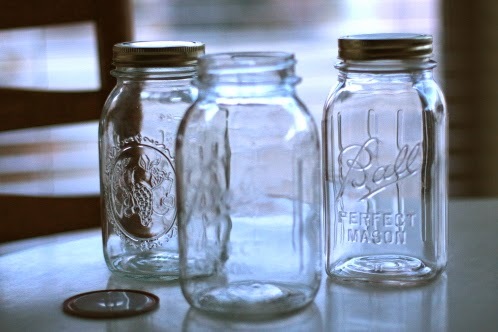 Continue this habit and soon you’ll have a jar for each year. so it was easy to remember to jot stuff down. week. Here are the "ingredients:"
and a bow, and a label. It was so easy to make a dozen of these to take to my class. group or Sunday School class or Bible study group too. This is the third time in a week I've seen a blessing jar suggested. One source also said you can jot the best thing about your day. I like that idea, too, although jotting blessings best engenders gratefulness to the giver of all good things. Your ideas of nature's beauty, accomplishments, and LOL moments are also great.